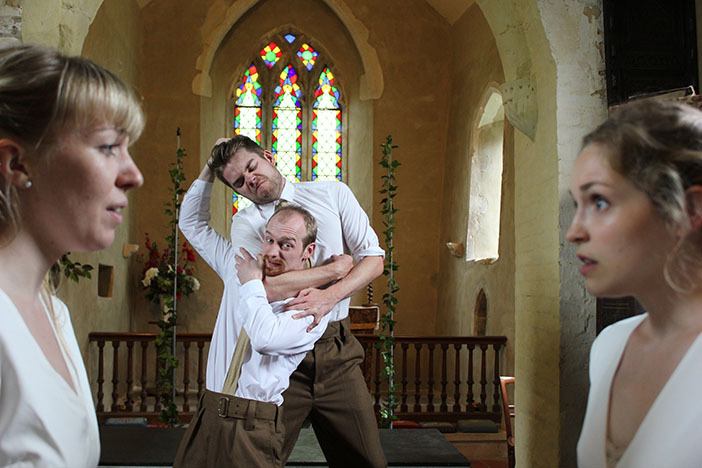 Fancy a bit of classy drama in a laid-back venue, with tight acting and imaginative staging? If so, this production of ‘A Mid Summer Night’s Dream’ is for you. It’s been devised by This Is My Theatre company, which specialises in accessible performances for all ages in unusual community venues. At its simplest level, Shakespeare’s romantic comedy, written at the end of the 16th century, is a tale of love forbidden and love mistaken. The main action takes place in the countryside which presents an opportunity for woodland costumes and a mythic atmosphere. There’s also a play within a play with the clipboard-waving mechanicals providing a dash of farce. It’s certainly child-friendly. For adults, this production of the popular play – which sticks close to the original script – also offers some deeper insights into the gaps between love and reason. For those not familiar with the classic plot, a micro-summary translated into a contemporary setting may help. So, remember that night you camped out in the woods at the Glastonwick Festival? Maybe it was the recreational drugs that led to a risky partner swap. It was all a bit hazy the next morning. But, eventually, you came to your senses, got back with your original squeeze, and still kept your hands on the family inheritance. You get the general idea. This production may be more faithful, but it still has its share of infidelities. The woods serve as a transformational location where Oberon – a thoughtful albeit mischievous King of the Fairies – orchestrates his experiment in love. His magic potion interchanges the affections of our two mortal couples. There are enchanting snatches of words and songs in Gàidhlig (Scottish Gaelic), threaded in by the company’s resident composer, Simon Stallard. The play, of course, lends itself to an outdoor venue. The cast emerge artfully from the audience and into the amphitheatre. The acting is tight and well observed. Oberon is suitably distant and thoughtful as he watches the action unfold. Hermia confidently pursues Lysander, her hunk. Meanwhile Demetrius, her intended, is pursued by a spirited half-cockney Helena. Occasionally words are lost in the breeze, but the set and costumes are delightful without being fussy. Baby trees are planted round the set. Ferns are sewn into the balletic skirts. It’s beautifully enacted. We’re lucky to have a dedicated outdoor venue at the Brighton Open Air Theatre. The staff set the atmosphere by making this a friendly night out and there’s a convivial and attentive audience. Aficionados of the venue will tell you to bring a cushion to sit on with a picnic and hot flask for the interval. There’s also a pop-up bar for beer and lemonade. Some exquisite accidental moments come for free. At the sun sets, the trees rustle and we hear a blackbird’s evening song. But it’s Brighton, so, inevitably, a seagull wheels in to squawk the last call. Look out for future classic productions by This is My Theatre around Sussex.